I’ve admired crocheted rag rugs for years, but never got around to making any until last week, and I’m having a blast. There’s something truly lovely about stitching strips of recycled cotton fabric softened by dozens of trips through the laundry. Today TV segment was inspired by the wonderful people behind the Rags to Rugs project at St. Andrew’s School in Grand Rapids, Michigan. Parents and volunteers are making rugs to sell to raise money for an emergency scholarship fund to help offset tuition costs for families who experience a job loss or other hardships. You can read the story I wrote for my newspaper and download some basic instructions to make your own. 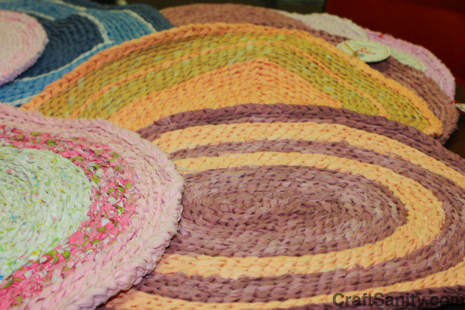 I’ll be posting more specific instructions about how I made the circular rug I showed in process on TV as soon as I finish it. This really is the best weblog for any one who wants to locate out about this topic. You realize so considerably its nearly difficult to argue with you (not that I really would want…HaHa). You undoubtedly put a brand new spin on a subject thats been written about for years. Great stuff, just great! I happen to be writing to make you know of the nice experience our girl enjoyed studying yuor web blog. She learned some issues, including what it is like to have a marvelous coaching style to make the others with no trouble have an understanding of a variety of tortuous topics. You actually surpassed our own desires. Thanks for rendering the informative, dependable, educational and in addition fun tips on the topic to Ethel. We’re a gaggle of volunteers and starting a new scheme in our community. Your web site offered us with helpful info to paintings on. You’ve performed a formidable job and our entire community can be thankful to you.